RIO DE JANEIRO: Lionel Messi returns to the World Cup stage here Saturday as Argentina look to become the latest side from Latin America to book their place in the second round after Chile, Colombia and Costa Rica. Argentina face Iran in Group F in Belo Horizonte knowing that three points will carry them into the last 16 after their opening 2-1 victory over Bosnia at the Maracana Stadium. Messi created one goal and scored a wonderful individual effort in that victory and will fancy his chances of adding to his tally against an Iranian side who were poor in an opening 0-0 draw with Nigeria. Iran's defence could be in for a busy afternoon at Mineirao Stadium after the Barcelona star urged Argentina coach Alejandro Sabella to give him more attacking support in the starting line-up. After an uncertain start against Bosnia, Argentina became a more fluent attacking force once Gonzalo Higuain was introduced alongside Messi and Sergio Aguero in a front three. 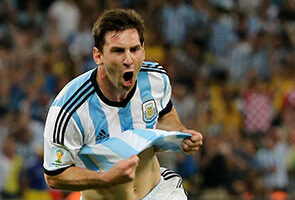 Messi said he feels more comfortable playing with Higuain and Aguero in attack. "We are Argentina and I think we need to concentrate on ourselves without fixating on who we are playing," said the four-time world player of the year. "We feel more comfortable with two up front and me behind because it makes it easier to counter-attack and, because we have more people in attack, we have more possibilities." Germany, who beat Portugal in their first Group H game, will meanwhile look to put one foot in the second round with victory over Ghana. Germany have a history of struggling in the second game at major tournaments and coach Joachim Loew has urged his squad to hit the ground running. The Germans lost to Serbia in their second group match in South Africa four years ago and in 2002, 1998 and 1994 drew after opening victories. They lost as well at the 2008 European Championships. "From a mental point of view you have to pay a lot of attention," said Loew on the eve of the Group G match in Fortaleza. "We saw it in 2008 and 2010 when we lost the second match after winning the first. We don't want this kind of problem again. "Italy have just seen it against Costa Rica and the Netherlands struggled as well against Australia. It's great to win the first match but you have to continue. One victory is not enough, you have to keep your concentration." Loew said that Ghana, who lost their first game 2-1 against the United States, would be playing for their lives. "For them it is a final. If they lose it will be nearly over. They are going to fight until the end. They are strong, they are athletic. They attack, they have a lot of players at very good clubs, we know them well." The day's other game sees Nigeria face Bosnia with the African champions's coach Stephen Keshi saying the Super Eagles would seek to improve on the the drab Iran stalemate. "We could not give our style of play (but) tomorrow will be a different game. Bosnia have a different style of play and mentality, and we will be ready for them. "The goals weren't coming against Iran, there was a lot of anxiety, we couldn't produce our way of playing. "Nigeria is a difficult place, but at the same time they appreciate football. "Against Iran they felt it wasn't our true ability, they were disappointed in the performance of the team. "They felt we didn't perform as highly as they were expecting, but we're here for business."